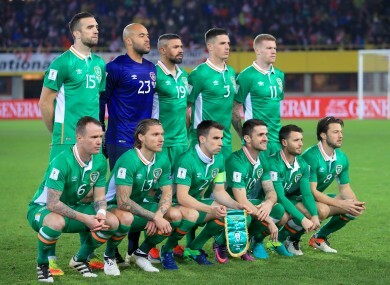 The Ireland team (file pic). IRELAND HAVE MOVED up a place in the latest Fifa rankings. Despite having not played a match since beating Austria 1-0 in a crucial World Cup qualifier last November, Martin O’Neill’s side have moved above Turkey and now sit 24th overall. Gareth Southgate’s England are down one place to 14th, while Argentina still top the rankings with fellow South American side Brazil in the second. Ireland’s other World Cup group rivals, Serbia, have slipped to 52nd, while Georgia are down to 126th, Austria fall to 34th, and Moldova have moved up to 162nd. Email “Ireland climb a place in latest Fifa world rankings”. Feedback on “Ireland climb a place in latest Fifa world rankings”.